About ten months after their landmark self-titled debut landed on store shelves, The Doors followed it up with Strange Days. As noted in virtually all writings of the album, most of the songs had been written around the same time as The Doors but had been passed over. The two singles that appear here need no introduction and will be familiar to anyone with access to FM radio – “Love Me Two Times” and “People Are Strange”. The title track starts things off with swirling keyboards, including a moog synthesizer played by one Jim Morrison. This leads into “You’re Lost Little Girl”. It’s one of those tracks that proves why Greatest Hits don’t always tell the full story. The haunting little pop song with a beautiful vocal by Morrison has been lodged in my head for days. “Unhappy Girl” and “My Eyes Have Seen You” are pure psychedelic confection. The disc is broken up halfway through with the ugly spoken word track “Horse Latitudes”. And try as it might, eleven minute album closer “When the Music’s Over” doesn’t quite reach the mesmerizing heights of “The End”. 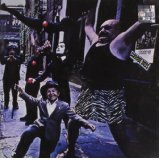 While the debut is rightly regarded as the classic in The Doors cannon, Strange Days is only a half-step behind. While not a smash hit at the time, it has since gone on to have sold over 9 million copies. 1967 was one of the greatest years in rock history, and this is just one more reason why.